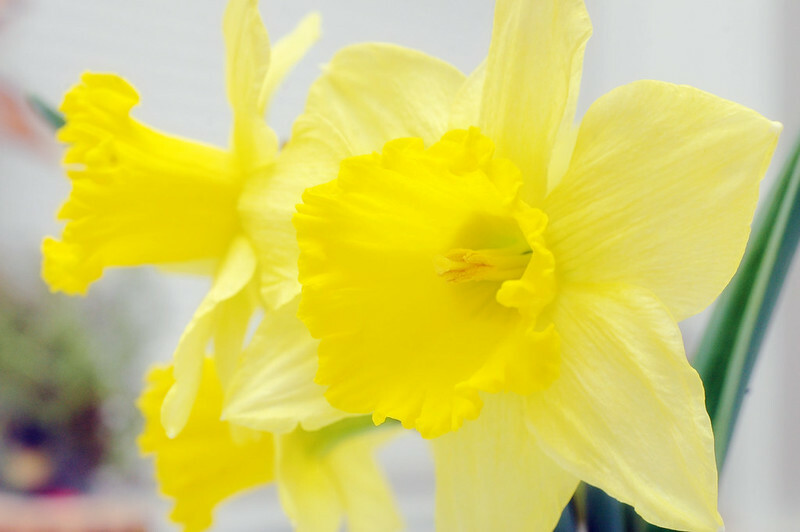 good news, bad news for the passive aggresively named Narcissus pseudonarcissus. well, the good news is that after an cool spring that left you wondering when spring was actually going to arrive, on the first of may it was finally warm enough for long enough for the Narcissus pseudonarcissus outside to bloom. the bad news is that it’s supposed to dip below freezing tonight, and we might even get a little snow(?!) tonight or tomorrow. so i cut some of the flowers down and brought them inside to enjoy their short but sunny life inside. truth be told Narcissus pseudonarcissus, or the common daffodil, is not my favorite Narcissus ( that would be the Narcissus poeticus ) but every time i see one Narcissus pseudonarcissus i wonder, “why the passive aggressive scientific name”? it’d be like naming Homo pseudohomo. i mean, your either a Narcissus or your not. i imagine whoever named it first was so disappointed in it, they decided to forever call into doubt whether or not it was really a member of the genus. Previous PostPleasant Ridge Organic Hot LunchNext Postday 3225: odin has chickenpox! or, hey, why isn’t he vaccinated?